Cardiogenic shock takes place when the heart has been damaged so much that it is unable to supply enough blood to the organs of the body. 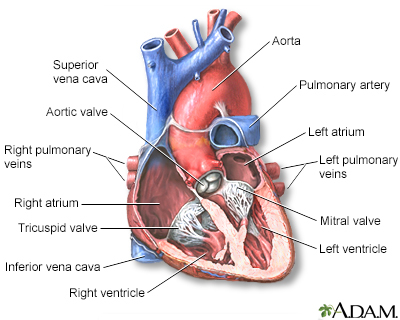 Cardiogenic shock occurs when the heart is unable to pump as much blood as the body needs. It can happen even if there hasn't been a heart attack if 1 of these problems occurs and your heart function drops suddenly. To diagnose cardiogenic shock, a catheter (tube) may be placed in the lung artery (right heart catheterization). Tests may show that blood is backing up into the lungs and the heart is not pumping well. Other studies may be done to find out why the heart is not working properly. Cardiogenic shock is a medical emergency. You will need to stay in the hospital, most often in the Intensive Care Unit (ICU). The goal of treatment is to find and treat the cause of shock to save your life. These medicines may help in the short-term. They are not often used for a long time. In the past, the death rate from cardiogenic shock ranged from 80% to 90%. In more recent studies, this rate has decreased to 50% to 75%. When cardiogenic shock is not treated, the outlook is very poor. Go to the emergency room or call the local emergency number (such as 911) if you have symptoms of cardiogenic shock. Cardiogenic shock is a medical emergency. Michael A. Chen, MD, PhD, Associate Professor of Medicine, Division of Cardiology, Harborview Medical Center, University of Washington Medical School, Seattle, WA. Also reviewed by David Zieve, MD, MHA, Medical Director, Brenda Conaway, Editorial Director, and the A.D.A.M. Editorial team.